The Cooking Photographer posted this recipe over two years ago and her picture, with the caramel and peanuts oozing out, planted itself and made deep roots in my cranium. Then she had to go and use that same picture in her website header, reminding me weekly how much I wanted to make them. Well, as I may have mentioned before, cookies are my favorite food group (in my perfect world, yes, they would be a food group, and a prominent one), and as I may have also mentioned, I do not make treats that I REALLY like very often because I simply can not trust myself with them. I knew I would be in trouble if I made these without a specific purpose in mind and without a good reason to get rid of most of the batch. That reason finally arrived with The Great Blogger Cookie Swap of 2011. (If you missed this year’s, sign up to be notified of of next year’s swap here!) I had just picked up a bunch of half price Halloween candy when I was brainstorming what kind of cookies I could make for the swap, and how I could use up some of the candy I bought and of course, the first thing I though of was Laura’s Sneaky Snickers Cookies. Well, the batch made enough that there was still plenty for me to sample and go a little overboard on, but it was well worth it! 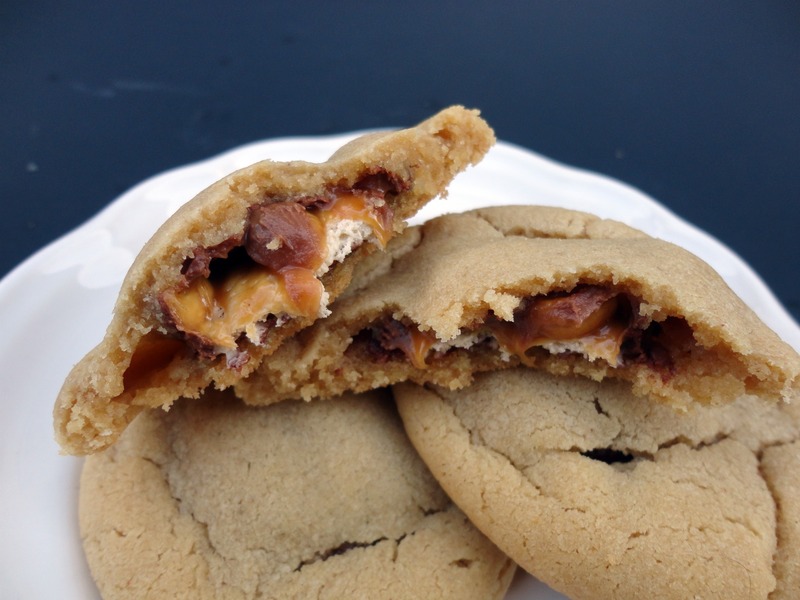 Soft peanut butter cookies surrounding a chewy chocolate, peanut, caramel, and nougat center is just a lovely combination. 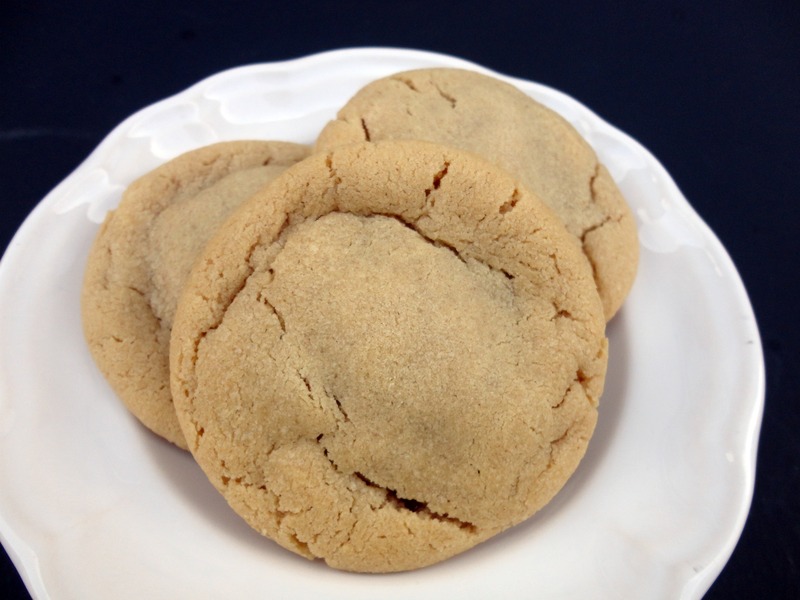 I especially love them warm so that the middles are oozing gooey caramel when you bite into them, and might have kept a few for myself in the freezer to nuke in the microwave for cookie-craving emergencies. They are so yummy! Preheat oven to 350 degrees. 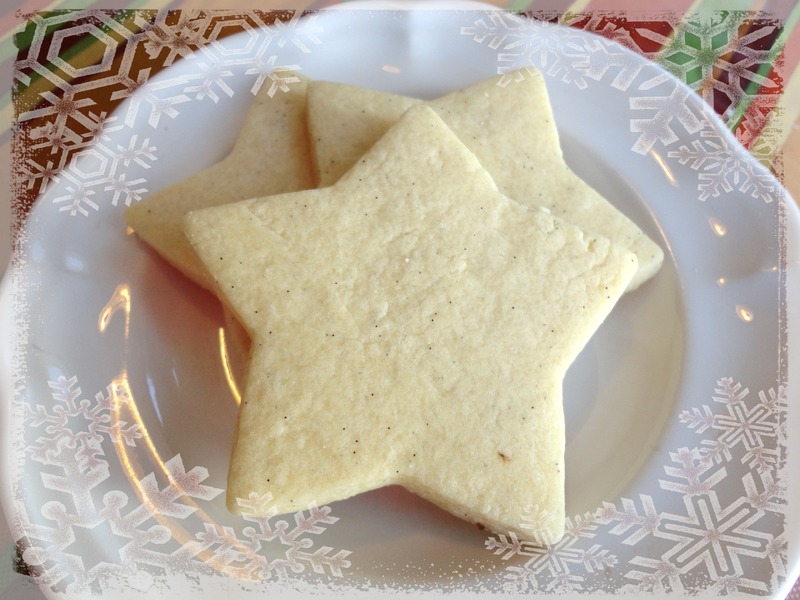 Cover cookie sheets with parchment paper. In the bowl of a stand mixer, add the butter, sugar, brown sugar, salt, and vanilla until light and fluffy, five minutes. Add the peanut butter and beat until combined, another minute. Add the eggs and baking soda and beat until incorporated, scraping down sides of bowl. Add the flour and beat until just incorporated. Don’t over-mix. Press plastic wrap down over the surface of the dough and refrigerate at least two hours before baking. Unwrap 52 mini Snickers bars. Then with a standard cookie scoop (size 50), scoop the dough into your hand. Press the dough together and flatten. Place a Snickers bar in the center of the dough and push the dough around to seal, rolling into a ball. Place cookies 2 inches apart on cookie sheets and bake for about 12 minutes. Let the cookies rest on the baking sheets for 5 minutes before removing to cooling racks. Recipe source: The Cooking Photographer, with slight changes in preparation method. I wanted to share the cookies I received through this swap as well! Click the blog links to get their recipes, which are posting today. Christian of M.E. 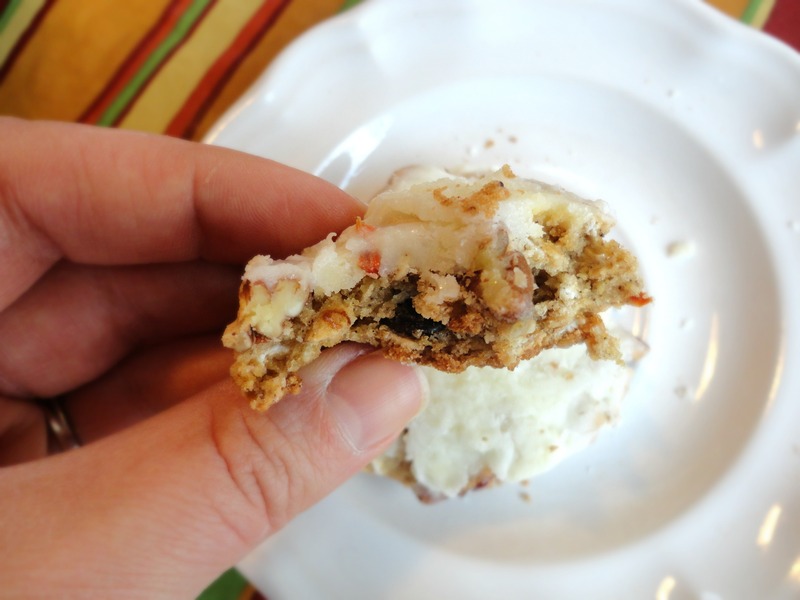 sent me these Carrot Cake Cookies with Cream Cheese Icing and they were a lifesaver. It was 4 PM when I received them, and I hadn’t eaten anything all day. I was running on empty and didn’t have time to stop and figure out something to eat. I ripped into the cookies and ate half a dozen right away, which got me through to the party I was preparing for. Thanks, Christian! 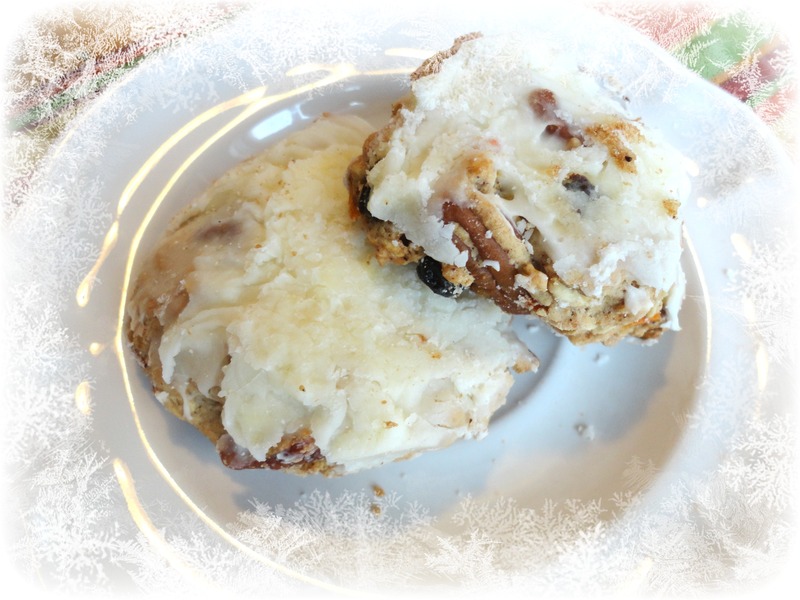 Check out the carrots, nuts & raisins these cookies were loaded with! Julie M. of Burnt Carrots sent me my favorite batch of cookies, at least for the blogger swap. Her Chocolate and Butterscotch Chip Cookies took me by surprise because I would have thought they had butterscotch chips in them, and maybe they do, but they also have toffee chips and I looooove toffee. 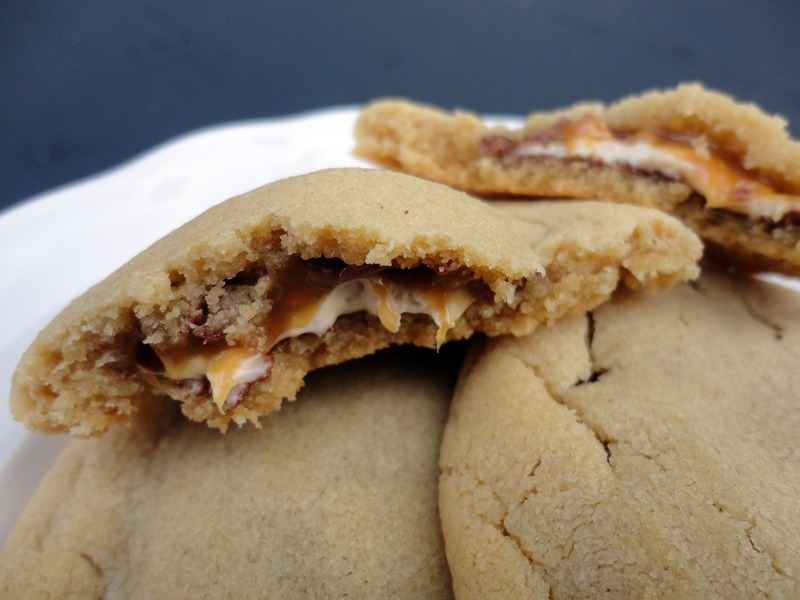 The combination of chocolate chips and toffee is a winner! 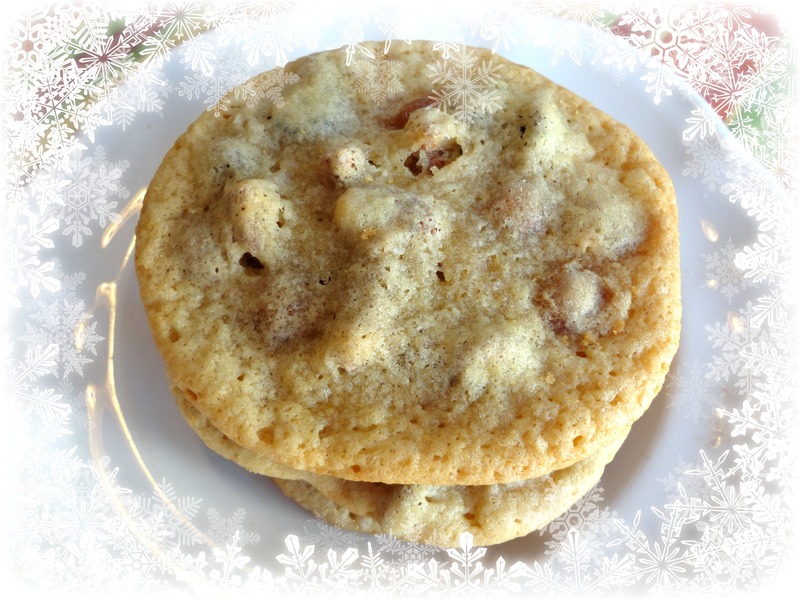 I also received cookies through my own cookie swap for non-bloggers, and will share those with tomorrow’s cookie recipe that I sent out for that swap! Posted in Cookies and tagged baking, desserts, gifts, holiday, peanut butter, sneaky snickers cookies, snickers, soft, stuffed cookies, sweets. Bookmark the permalink. Oooh, those melty Snicker middles look so scrumptious. I fully endorse the idea of keeping a few in the freezer to heat up again for emergencies. I am just like you… I cannot make delicious treats like these without a purpose or I will eat them all myself! These look fantastic… I bet the recipients of these cookies were thrilled! Oh I so wish I had gotten a dozen of your cookies! Although maybe it is better that I didn’t because I would have eaten every single one. I thought my boyfriend’s eyes were going to roll back into his head permanently when he tasted these! 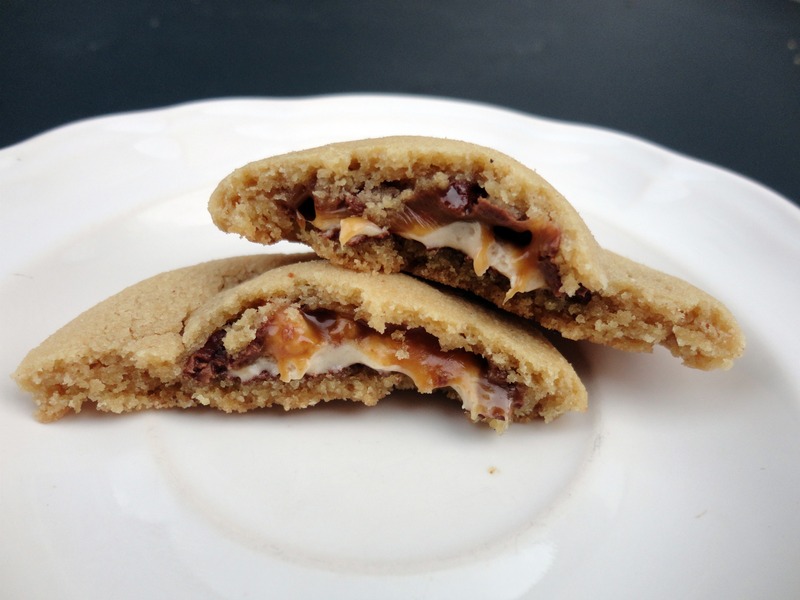 Needless to say, I will never be able to make these, because I am pretty sure we’d sit down and eat the whole batch. Delicious! Thanks, Veronica! I was so hoping I would have received your name for the cookie exchange:) I have to say too, these look totally sinful, lol. Definitely a must do! 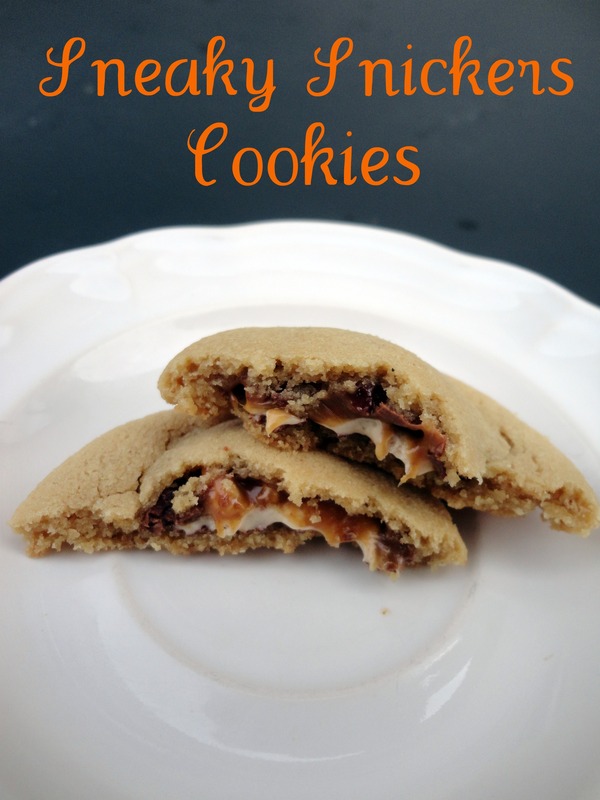 These are the most tempting cookie I have seen so far on the #FBCOOKIESWAP! They look kind of ridiculous! Enough to get back in the kitchenone more time!